Understanding Psychopathy is an essential, accessible new guide on psychopathy and its development. 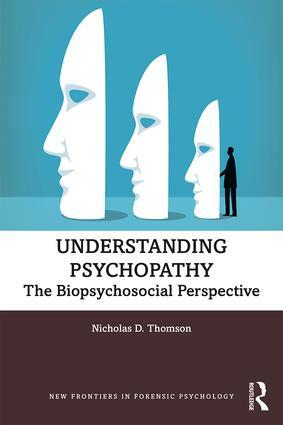 Through the lens of the biopsychosocial model, Thomson explores a wide range of factors contributing to the development of psychopathy, from the genetic to the environmental, supported by the latest research into the disorder. Thomson examines psychopathy from all angles, analysing social, psychological and biological factors, in addition to the history and assessment of psychopathy, and links to violent crime. Theory and research are supported throughout with fascinating case studies. These case studies provide accessible and relevant examples for readers who are new to the field, and to those more familiar with psychopathy and its implications. Understanding Psychopathy is a brilliant resource for psychology students, researchers and practitioners in the criminal justice system alike, with grounding in forensic psychology, clinical psychology and criminology. The author is donating his royalties in full to Project EMPOWER, UK, a multidisciplinary initiative dedicated to enhancing prevention and intervention services to individuals and their families who experience intimate partner violence, sexual violence, domestic violence, or human trafficking.